Oh how I love summer fruits and vegetables. And I love picking my own. My parents used to take us to pick apples, peaches, and strawberries when I was a little girl. I still remember those trips fondly. Since we had beautiful weather this weekend, I took a trip out to the country with one of my girlfriends to pick blueberries. It was so fun! Now, I'm a city girl... I definitely shrieked and squealed more than usual when I had june bugs landing on my shirts and spiders crawling on our freshly picked berries. I'm also not incredibly fond of getting muddy and wet (it had just rained). But, I do enjoy an occasional foray into the countryside. And, there's such pride in picking your own fruit. Like when you find a blueberry the size of a dime and show it off, "Look at the size of this one!" Of course, you have to throw that one in your mouth just to taste the fruits of our labor. Or when you see a patch of really good berries and say, "Ooh, those are mine," and you get up on your tippy-toes to reach them. I also take pride in how fast I can pick them, "I'm up to 9 pints... you only have 7!" It's a totally different experience than going to the grocery store and inspecting a plastic container for the best looking berries. I think it's even more fun than going to the farmers' market and buying what someone else has picked. You also pay a totally different price than at the grocery store or farmers' market. At the farm, organic blueberries cost us $1.75 a pint. That's right! At Whole Foods, they go for about $4 a half pint, and that's when they have a sale! So, of course, we picked 12 pints. We meant to pick only 8, which is a gallon of berries, but got carried away and were racing to fill all of our containers. It took us about two hours straight. We gossiped, picked, and shoved blueberries in our faces. So, at the end of the day, we drove home in the sweatiest clothes of all time, with 1.5 gallons of blueberries in bags, and probably at least 2 pints in our bellies. Don't tell the farmers! As I looked over my recipes for blueberry desserts, I kept seeing things calling for 3, 4, even 5 cups of berries. And I got worried... what if we run out? I don't know if we have 5 cups of berries. I can't afford to use that many berries on one dish. And we had 1.5 gallons. That's 6 blueberry pies! Or 48 smoothies! Or 48 batches of buckwheat blueberry pancakes! So, I relaxed. And then I baked the most delicious blueberry pie I've ever had. The recipe is below. If you have children, this is one of the greatest activities you can do with them, especially if you live in the city or suburbs. It's great for them to grow up knowing that everything comes from the ground and that we have to take care of the Earth. They also learn that nothing is free. There is always labor involved somewhere along the line. They learn to appreciate everything they have and can buy, and they will waste less. Believe me, we would freak out if one little berry fell to the ground rather than into our picking container. After doing all that work, you just don't want to waste any of them. Childhood obesity in the United States is alarming and sad, and I don't think we can teach children early enough how to eat healthy foods. If it's something fun for them, they are more likely to continue the habits into adulthood. For me, that day in the country was like being in Candyland. Now, if you take a ride to the country and pick some of nature's jellybeans, you will probably end up with quite a few leftovers, like me. I was taught to make sure not to wash your berries right away. The water will make them wrinkle. Also, you can freeze them to eat during the winter when you can't get local berries. Again, don't wash them. Just line a cookie sheet with your berries and freeze them for about half an hour. This is called flash freezing. You can then load them in plastic bags and store them for about 6 months. Don't take my word for it, try it yourself! Support a local farmer and fill your belly with one of nature's superfoods. After we had been picking for about an hour, one of the farmers pulled up in his tractor and showed us some gorgeous corn. He said it was a type called Ambrosia and invited us to try some. I couldn't pull off a kernel, so he held it up for me to bite. Now, I can't honestly say that I've eaten raw corn before, but I'm pretty sure that if I had, it wouldn't have tasted like this. His corn was by far the sweetest, most delicious corn I've ever had. In Greek Mythology, the word ambrosia meant "the food of the gods." Ambrosia in the dictionary is "something with an especially delicious flavor or fragrance." I've never eaten a more aptly named ear of corn. So, of course we had to buy a bunch of corn as well. We steamed it and ate it as is. No butter, salt, or pepper. I probably could have eaten 10 ears of corn myself. Corn is also delicious on the grill. I love it de-husked and placed directed on the grill because it turns brown and caramelizes into the sweetest vegetable. Yum. 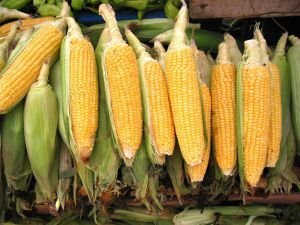 You can also keep the husks on (make sure to soak them first so they don't catch on fire) and the corn gets super juicy and smoky. Corn is one of those joys of summertime on the east coast. It never tastes as good in the winter. Have you ever thought about why? You might know already how food is transported, but since it took me reading several books to find out why, I decided to mention it just in case. Most vegetables (and fruits) that we buy in the grocery store are grown by a few enormous (bigger than you can imagine) farms around the world. Depending on which vegetable, it could be from a farm in the US, Mexico, South America, India, Australia, or New Zealand. What's nice is that when it's winter here, it's summer south of the equator. So, they are growing tomatoes, corn, and strawberries while our crops are covered with snow. That's the benefit of globalization. The drawbacks are more plentiful though. First of all, you can't ship ripe fruits and vegetables thousands of miles in planes, boats, and trucks. Why not? Well, because they would rot. So, the fruits and vegetables are picked well before they are ripe. That means they have far less flavor, sweetness, and health benefits than a freshly picked fruit or vegetable. Once they have made their long journey, they are sent to huge warehouses where they are ripened using ethylene gas. Then, once ripened, they are shipped to your grocery store. The sad thing is that even if the vegetables are grown in the United States, and maybe even on a farm close to you, they are still sent to the warehouses, and then sent back to the grocery store near you. You are probably realizing now how terrible this is for the environment. Each veggie travels more than most people do in their lifetime. So, while we do get to eat things in the winter that our ancestors never were able to, we do so at a price. It's hard to say. The absolute best thing you can do is to eat seasonly and locally. Before refrigerators and gas warehouses and cargo planes, people ate what was available on the land near them. They would grow extra during the summer and fall and store it for the winter. They ate spring greens in the spring, summer squash in the summer, and fall root vegetables in the fall. They canned, dried, and smoked to save for the winter. In Florida and southern California, they ate well year round. In fact, the name Florida came from the Spanish word for "flourishing." California was named after a paradise from a Spanish novel. Could it have been that they were refering to the foods in those parts of the country? Probably. Really the best thing you can do is to get your produce from a local farm. Find your food at farmers markets and join Community Supported Agriculture groups or coops. Think about growing some of your own crops. Even on a small deck, you can pot herbs and smaller vegetables. You could even trudge out to a farm on the weekends and pick your own. We all have places near us, even if we have to travel an hour and a half to get there. We're still burning far less fuel than if we bought it at the grocery store. Here is the outrageously scrumptious blueberry pie recipe that I made after I got home with all those blueberries. It comes from The Joy of Vegan Baking, by Colleen Patrick-Goudreau. Take a look at my rave review of her book. Her cookbook is fabulous-- everything I've made has been out-of-this-world. If you haven't just hit up your local blueberry farm, you can certainly use store-bought or frozen blueberries. This recipe calls for store-bought crusts, but you could go all the way and made the crust too. I think that's actually part of the key to this being so delicious. The crust recipe is on the Vegan Nutritionista site. 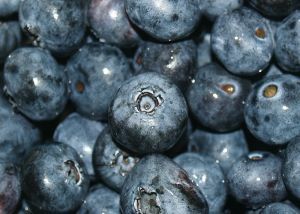 If you are using frozen blueberries, let them sit out for about 15 minutes and then strain the juice. Punch holes in your pie crust with a fork and prebakefor 10 minutes. Remove the crust from the oven and let it cool. For the top crust, you can either use another whole crust, make a latice design, cut shapes with a cookie cutter, or leave it off. If using, roll the crust and leave it in the fridge until you are ready. In a big bowl, combine the sugar, cornstarch, lemon juice, and lemon zest. When the mixture is creamy and combined, fold in the blueberries..
That's it! Then put the mixture into your prebaked pie crust. Cover with the other crust if you are using. Bake at 425 degrees for 30 minutes. Then, reduce the heat to 350 degrees and put a cookie sheet under the pie pan to catch drippings, and cook for another 25-35 minutes. The worst part about this vegan dessert is that you should let it cool for at least 1 hour and preferably 3 hours before cutting and eating. The second recipe this week is the quintessentail summer dish for me. It's made with fresh tomatoes, basil, garlic, hot peppers, olive oil, and pasta. Ooh La La! My mom insists that she shouldn't get credit for this dish and that she found it in some magazine years ago. I've never seen this mysterious recipe clipping, and I know she free-hands the dish, so I really think it's her dish. The "La Caprese" in the name probably comes from the island of Capri, outside of Naples, Italy. Click here to learn how to make Pasta la Caprese.